Green Gables makes at least 20 clients happy simultaneously through its large-scale remodels, smaller gut remodels, custom-built new homes, and some commercial work. And does so with a 50- person staff that includes an eight-member design team (five of whom are licensed architects) and no marketing—not even a job sign. 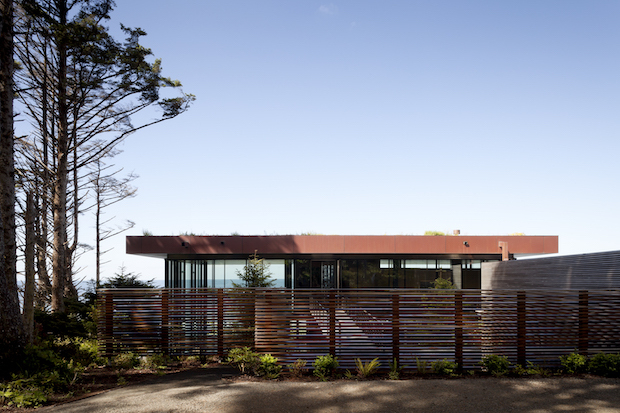 Located on the Pacific Ocean, this contemporary Oregon beach house designed by BORA Architects, in Portland, Ore., was built by Green Gables and is emblematic of the design/build company’s work. Contrary to what marketing professionals may counsel, this strategy even sustained the company during the most recent recession. “We didn’t have to lay anyone off,” says Rapfogel, who admits it was a tough time, during which there was some attrition and Green Gables took on some commercial work to keep people busy. “But, still, we never threw up a sign,” he says. Clients are referred by previous clients, family members, and architects (35 percent of projects are designed by outside architects). “Or, if someone has seen or heard about a house we’ve done, they reach out to us,” says Rapfogel, who believes this pre-vets clients. Originally from St. Louis, Rapfogel studied art and design, graduating in 2003 from New York University, where he met his wife. He worked as a sculptor and printmaker, but after a few years, he says, New York was too expensive and too fast paced and the couple didn’t like the culture. So they moved to Portland, Ore., in 2007, where Rapfogel began working for his father-in-law as a laborer. 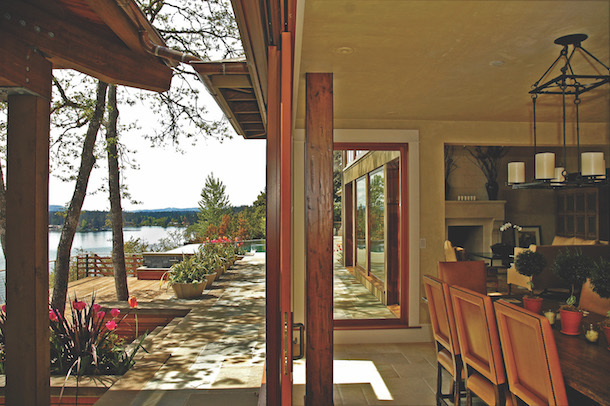 Designed and built by Green Gables, this Lake Oswego home was a foundation-up rebuild that features large sliding doors, specialty plaster, abundant outdoor living space, and a new boathouse. That team aspect characterizes the company from the top down and filters through to its client relationships. “Everything we do is completely open-book, even the bidding process,” Rapfogel says. Unless clients say they don’t want that level of involvement, Green Gables shares “every cost on the invoice from subcontractors to suppliers to the dumpster and porta-potty,” he says. Clients see the hard costs and the company’s fee and markup on a detailed spreadsheet. They see any change orders (of which there are usually only a few, according to Rapfogel) carefully documented. Green Gables works on time and materials, with a guaranteed maximum. “We’re all working together and aren’t hiding anything. If we come in under the guaranteed maximum price, we don’t ask for the maximum. Clients get the best of both worlds.” Their only cushion is a contingency, which varies by project. “We’re good at estimating,” Rapfogel adds. Stacey Freeed covers design and the built world from her home in New York state. 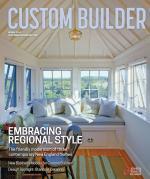 Comments on: "Back Story: Green Gables Opens Up Every Aspect of its Design/Build Process to Clients"